Successfully Added DOOGEE IRON BONE DG750 Mobile Phone - 4.7 Inch qHD 960x540 IPS OGS Display, MTK6592 Octa Core CPU, Android 4.4 OS, 3G (White) to your Shopping Cart. 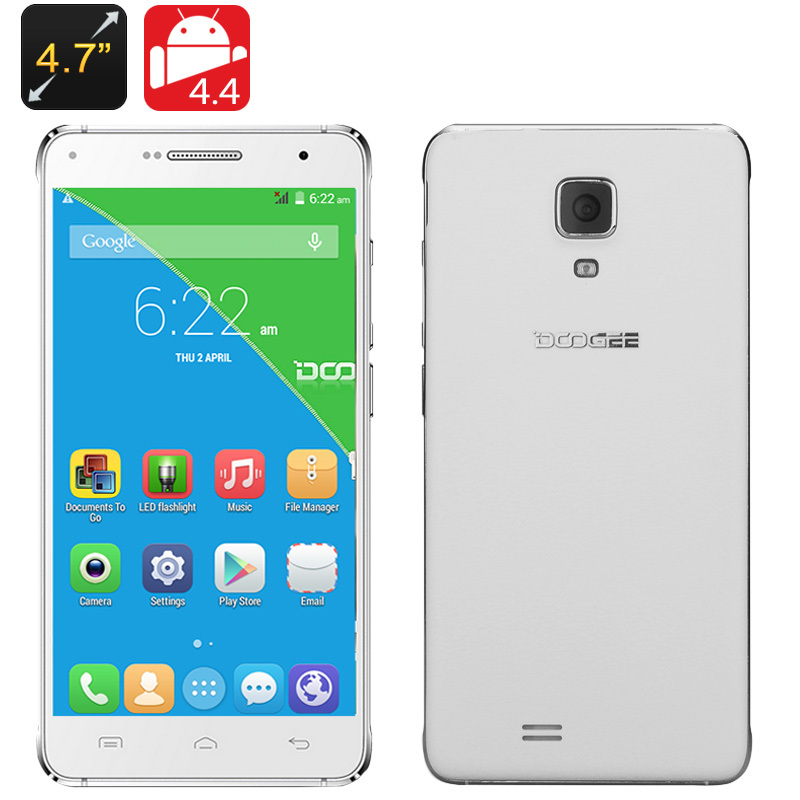 The DOOGEE IRON BONE DG750 Mobile Phone features a 4.7 Inch qHD 960x540 IPS OGS Display, a MTK6592 Octa Core CPU, Android 4.4 operating system and 3G Support. DOOGEE is not wasting any time with releasing quality made Android smartphones that are loaded with high quality specifications. The DG750 model, also referred to as IRON BONES is a sturdy phone, designed with an Aluminum-Zinc alloy frame which is manufactured with CNC methods. The IRON BONE utilize an octa core chipset CPU that can be clocked at 1.4GHz. Combine this high-efficiency and low battery-consumption 28nm processor with an Android 4.4 operating system for a genuinely fast performing phone. It carries a 2000mAh battery capacity that offers an ample amount of usage time to power its 4.7 inch capactive touch screen with 960×540 qHD resolution. The memory set that comes with the DG750 is 1GB of RAM as well as 8GB of internal storage; the latter can be expanded via a micro SD card inserted into the available built-in slot. The primary camera will be equipped with an 8.0 megapixel lens, while the front facing camera will have 5.0 megapixel. The Smart Wake functions allows for quick access to a range of applications without ever unlocking your phone just by simply tapping the screen twice to wake it up. Like other DOOGEE phones, the DG750 redefine the meaning of multi-functional. Apart from artificial leather back cover, you will enjoy face beautification to beautify any photo at will, besides, a global facial analysis will help focus on the face when making a ‘selfie’ shot. In addition, there is HotKnot file transfer technology, which allows you to freely share your movies, music and all other data directly. DOOGEE has done it again by creating a practical and a very affordable phone, this is the IRON BONE DG750. This product is in stock now, we guarantee next working day shipping and offer a 12 months warranty on all our products. Brought to you by the leader in electronic devices as well as wholesale DOOGEE smartphones, Chinavasion.